EXPO ‘70 was formed in Los Angeles by Justin Wright as a side-project, while he was playing guitar in Living Science Foundation (Second Nature Recordings; GSL50 Compilation). Initially, the group also included Wright’s friend, PK . The pair improvised creating sounds bouncing effect-ridden instruments creating a wide range of textures and moods. EXPO ‘70’s first recording and inception was during PK’s project SXBRS recording session, resulting in one of many split releases on PKs’ label. 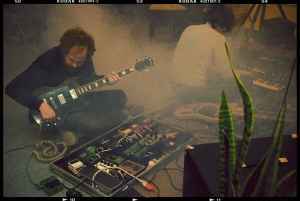 After playing two shows (with Parts & Labor and Tyondai Braxton respectively), they ventured back into the studio. “Live July 18, 2004” was recorded with the help of Bryan Levene /artist]), and recalls the spirit of the Taj Mahal Travellers improvisational drones. Returning to the midwest upon the breakup of LSF, Wright began developing EXPO ‘70 further, collaborating with McKinley Jones of the Kansas City-based Cantus Firmus. The pair recorded “Surfaces” in late 2005, adding synths over improvised guitar tracks pieced together by Jones. In February 2006, Wright completed “Exquisite Lust”, his first fully-realized vision of EXPO ‘70. Dozens of releases followed in its wake. Dive in anywhere, it's all good. Personal favourites include Closet Full of Candles, Awakening and Death Voyage, but I've never heard an Expo 70 track I didn't like. Laarsen, they're coming to Europe in September. This guy listened a lot of Ash Ra Temple & Tangerine Dream for sure. His music is mainly drone with some delayed/echoed guitars+synth. Not really rythmic except for some few moments a beat machine enter the trip. Many of their pieces may sound similar or repetitive from album to album... However each jam improvised recording has quite a different mood set, approach and spirit. Expo 70 should come to Europe.